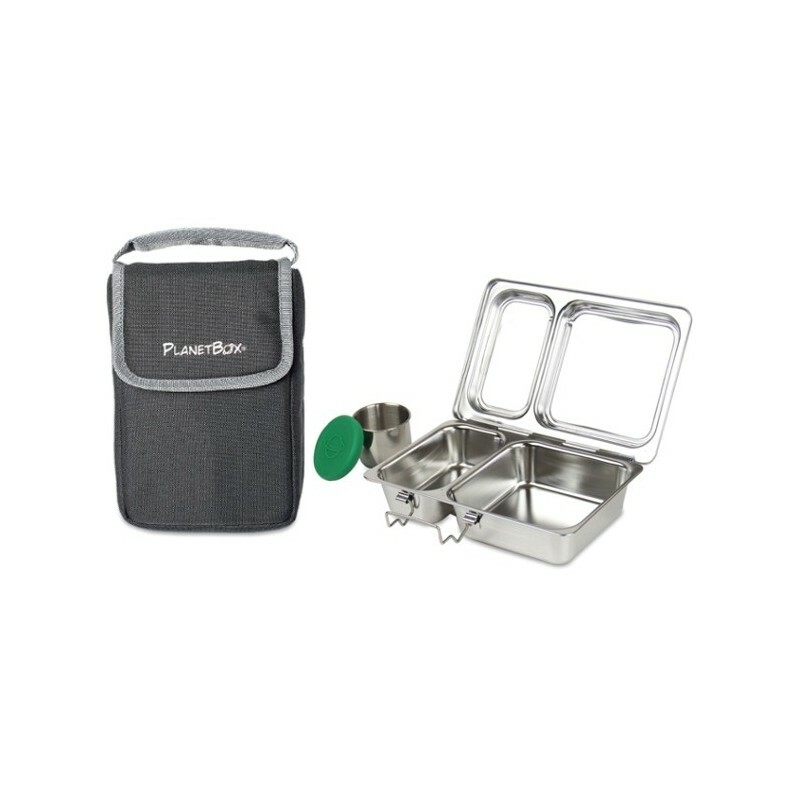 PlanetBox Shuttle is designed for packing healthy foods wherever life takes you. Good for younger kids with shorter school days,or as a separate snack packed in addition to a Rover. Choose your preferred bag style below. Buying this product = 82 Reward points for Members. Your cart will total 82 points = voucher of $4.10. Not a Member? Join at checkout to claim these points. 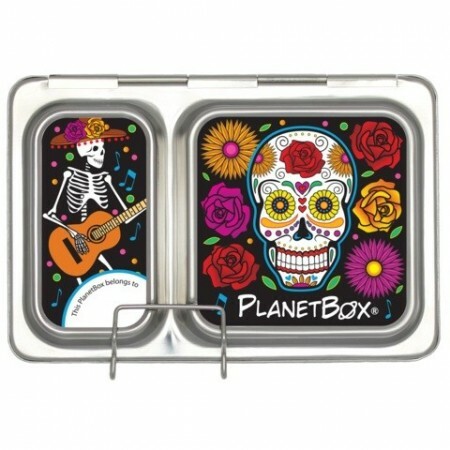 PlanetBox Shuttle is perfect for packing small meals and snacks on the go. The Shuttle set includes a PlanetBox Shuttle lunchbox, a tall dipper for dips and sauces, a super fun magnet set, and a compact Shuttle carry bag. PlanetBox is designed to keep foods from “touching each other.” When you close your PlanetBox the top and the bottom meet so that foods will not co-mingle, even when carried and stored on its side. The seal on the PlanetBox itself is not designed to hold wet, messy foods like yogurt, dips, and applesauce. The Dipper included is the best option to use for foods such as these. They have a silicone rubber seal that engages when placed inside the PlanetBox to create a tight leak-proof seal. Helps save money, time and packaging waste going to landfill. Stainless steel is 100% recyclable, meaning less waste in our landfills. The Magnets are made out of a synthetic rubber material that has been certified to be free of toxic materials. No lids to keep track because it's attached. 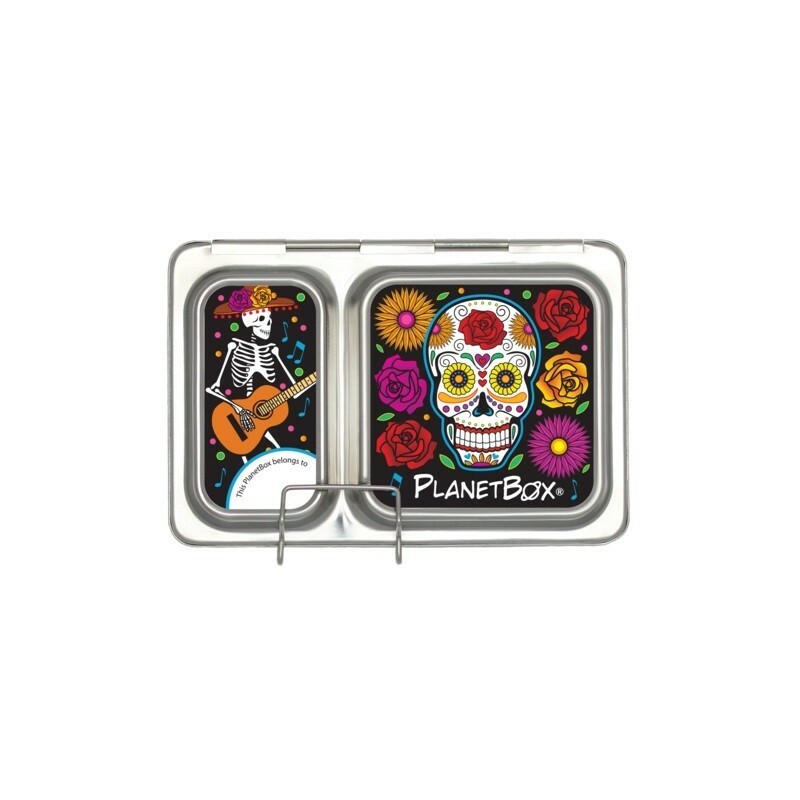 Includes fun magnets to decorate your Planetbox. Magnets are made out of synthetic rubber certified free of toxins (unlike PVC magnets). The latch on the PlanetBox lunchbox is designed for 3-year-old hands and older to close and open by themselves. Shuttle Carry Bags are designed to comfortably hold and transport your PlanetBox Shuttle, and are independently certified to be safe from lead, phthalates, BPA, and other harmful chemicals. Black, Red, Aliens and Butterflies bags are Slim Style. The plain Purple bag has an Expandable Pocket on the back to hold a BottleRocket water bottle and an extra pocket in front for additional items. Expandable style is an additional $4. A ColdKit can be included inside both style bags next to your Shuttle to keep it cool. Materials - The PlanetBox is made of high quality 18/8 (300 SS) and 18/0 (400 SS, not 200 SS) stainless steel. It is food safe and will not leach toxic chemicals when in contact with food. These types of stainless steel have been used for food storage in many cultures for generations, and are preferred materials for hospitals, commercial kitchens, and other environments where sanitation is a priority. Dipper lid is made from silicone that conforms to U.S. FDA and Europe’s stricter LFGB standards, and is safe from toxic chemicals.